In a recent eye opening survey of 116 Redis users, we at Redis Labs were pleasantly surprised by the enormous breadth and depth of Redis usage. Check out our findings here. 1. 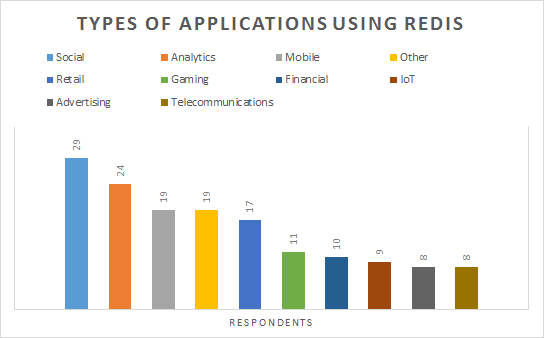 Top applications using Redis spanned Analytics, Mobile, Social, Retail, Financial, Gaming—and, additionally, there was a long tail of 16 other different types of applications. We knew Redis is a favorite, and now we found out that the love is spread across the board! 2. 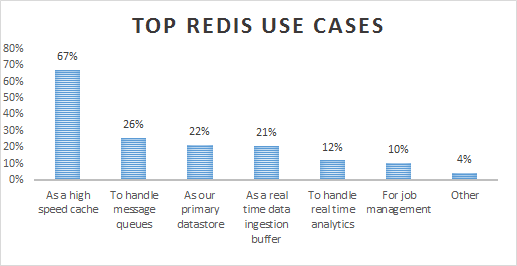 Almost half the respondents had more than a single use-case for Redis. We expected caching would be a popular use-case for Redis...what we hadn’t expected was how many people used it to handle message queues, as their primary datastore, and for high speed data ingest (total of 70% across all three). Dr. Josiah Carlson, author of the extremely popular book, Redis in Action, delivered a webinar on top use cases of Redis in which he reviews several more including distributed locking, ad targeting, and many more. You can watch the full webinar here. 3. 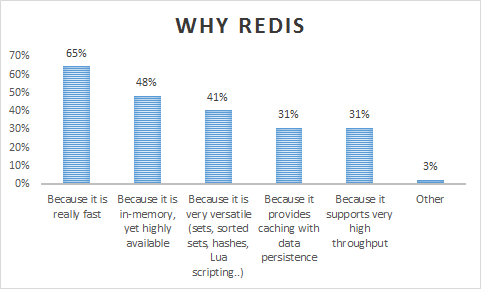 We also asked respondents why they chose Redis—and of course, Redis was chosen for its blazing fast performance—but that isn’t all. Redis is a persistent datastore despite being in-memory, and the high availability features of Redis make it quite popular. The versatility of Redis—its highly optimized and high performing data structures are a huge reason for the growing widespread adoption too. The sample companies included in this survey ranged from tiny startups like Fifth Planet Games and Learnbop to really large companies like Nordstrom, Telstra, and Fitbit and spanned a range of industries too. For more detail on the survey, do reach out on Twitter to @leena_joshi2015. Published at DZone with permission of Leena Joshi , DZone MVB. See the original article here.